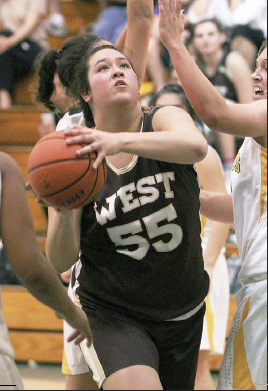 West Torrance High School got a gutsy fourth-quarter performance from junior Kylie Fujioka and a game-high 17 points from Kayla Sato, in a 49-38 Bay League victory over visiting Mira Costa last Friday. Fujioka, who had been sidelined recently with headaches, netted 14 points, 12 of which came in the final period. “I was feeling that if I was going to be out here playing, I am going to ‘play’ and give my best,” Fujioka told The Daily Breeze after the game. Mira Costa was led by junior Keilani Ikehara’s 11 points, and got six from frosh Halle Maeda and four from Michelle Lanterman. South High’s Kasey Takahashi netted up 12 points with five rebounds and the Spartans went on to a 42- 38 Pioneer League home win over Torrance. Leanne Kuwahara had five points for Torrance. At North High, Kylie Oshiro scored 12 points and had three as­sists, as the Saxons posted a 79-40 victory over visiting Centennial. Riley Kamiya added 10 points for the winners. In Bay League action, Redondo Union’s Nao Shiota had only five points but came up big on the boards, grabbing 10 rebounds in a 44-32 win over host PV Peninsula. Both teams suffered concerning injuries to key players in the game. Redondo’s Kourtney Noa came out in the third quarter after rolling an ankle, and Peninsula captain Hannah Bruno injured the same left shoulder that caused her to miss much of last season. Over in the Rio Hondo League, South Pasadena point guard Elise Takahama took control in the third quarter, connecting for three 3-point­ers in the Tigers’ 66-58 win over La Cañada. The victory moves South Pas into a tie for first place with the Spartans. Takahama scored a game-high 18 points, 13 of them in the third period. Sophia Hathaway added 14 for the Tigers. Courtney Chen paced La Cañada with 16. In the Mission League on Jan. 30, senior Dru Ishibashi led Notre Dame with 15 points, but visiting Harvard-Westlake came away with a 55-43 win. On the boys’ side of the ball, Dy­lan Kim netted 21 points for Mira Costa on Jan. 31, en route to a 70-39 run­away Bay League win over West Tor­rance. Matt Herrera led West with 16 points and four rebounds, while Kregg Maruyama added two. Chad Ashimine scored 11 for North Torrance in a 82-57 Pioneer League win over visiting Centen­nial.